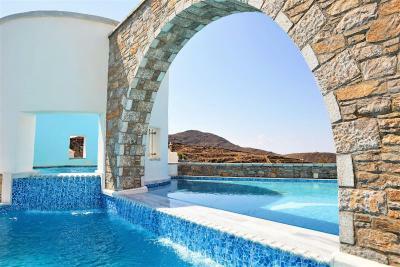 Lock in a great price for Vigla Hotel – rated 9.2 by recent guests! 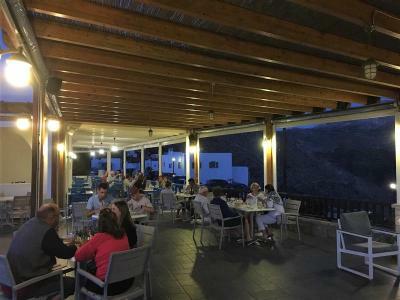 The Vigla is a small, family-run hotel located in a charming village near unique cultural attractions and several beautiful beaches. 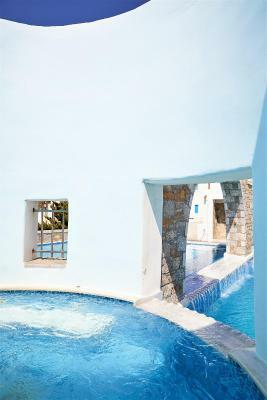 There is a big pool, a nice area for sitting outside and an overall feeling of welcome. The rooms are clean and bright. 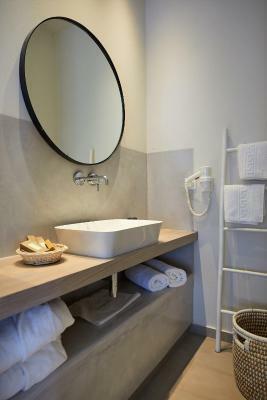 It is clear the the owners care about their property and care about their guests enjoying their stay. 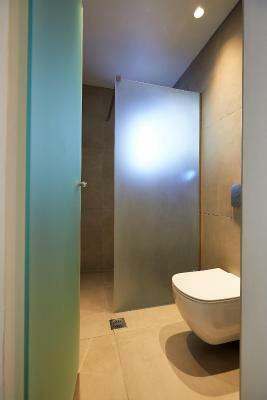 The hotel is intimate yet there is plenty of privacy. Staying in a small place, run by people who are truly invested in their guests' enjoyment is not an everyday experience. This is one of the things that makes the Vigla special. I would happily return with my family. Beds by far the best I've ever had anywhere in the Mediterranean area! Beautiful location with lots of interesting stuff to do. 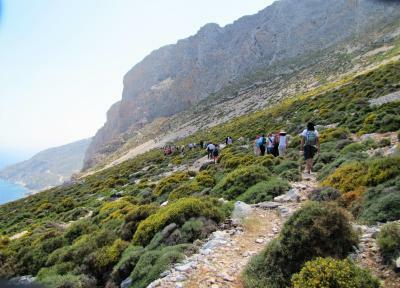 Mikro beach is super nice and a very pretty trek. Pool area is very nice also. Restaurant was way above our expectations with lots of local delicious dishes and amazing staff! Staff overall very helpful and nice. 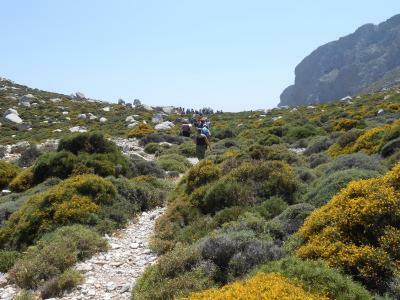 The staff gave us a map and brochure of the island and talked through all the things to see and do when we arrived, and were very knowledgeable about the best routes to take to make the best use of time, and they gave us a welcome drink on arrival! The hotel is very easy to find, it's the first one in Tholaria not far from Aegiali. The room was lovely, with a private balcony that had a beautiful view of the sunset. 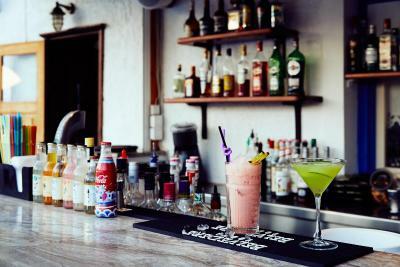 It has a relaxed feel and the staff are so friendly. We didn't swim in the pool but that area is lovely to dine in and have a drink. Overall it was a lovely stay, I would stay there again. Nice landscape, although it's very isolated and the little town is very tiny and doesn't offer much. Beautiful village, very nice accommodation, clean, quite, rich breakfast. Stuff was very kind, helpful and considerate. Great location, very nice and attentionate staff. Position, cleanliness and staff were excellent. Also the restaurant was fine. 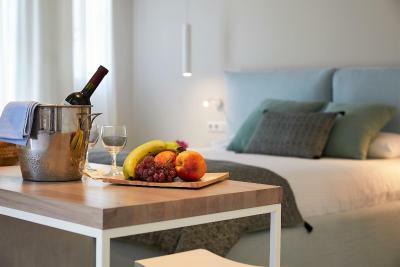 Vigla Hotel This rating is a reflection of how the property compares to the industry standard when it comes to price, facilities and services available. It's based on a self-evaluation by the property. Use this rating to help choose your stay! 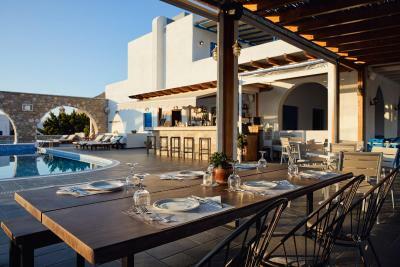 One of our top picks in Aegiali.Overlooking Aegiali’s sandy beach, Hotel Vigla is located in the traditional village of Tholaria. It offers a swimming pool with hot tub and comfortable sun loungers, and a restaurant with views over the sea. 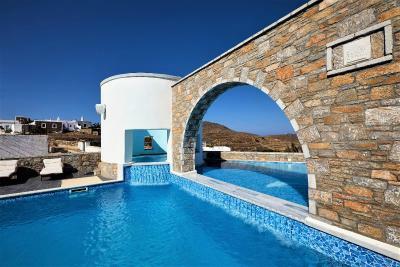 The bright rooms are built according to the traditional Cycladic architecture. 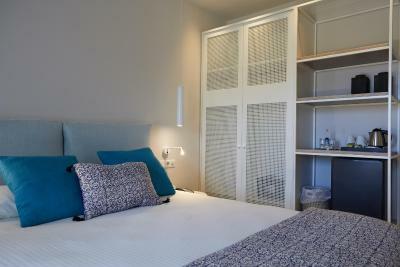 All units are air conditioned and include anatomic mattresses, TV and fridge, as well as a safe and hairdryer. Free Wi-Fi is provided at the hotel lounge. Traditional welcome drink is offered upon arrival. 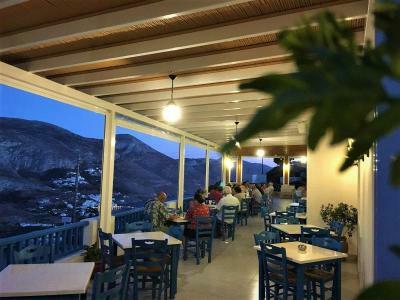 Vigla’s restaurant serves homemade Greek dishes, prepared with fresh local ingredients. 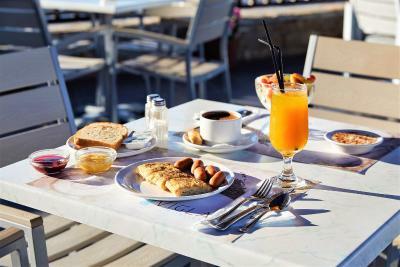 The hotel serves a rich, homemade breakfast in buffet style. 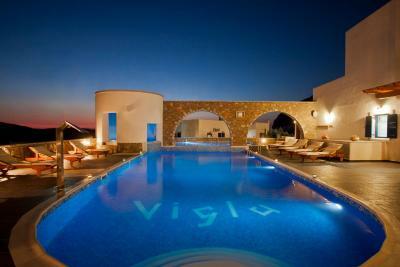 Hotel Vigla can arrange for taxi, car rental or transfer service. The reception is open between 7:00 and 24:00. 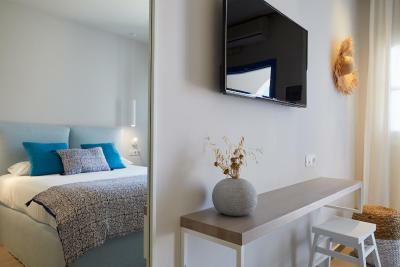 The hotel is just 1.6 mi from the port of Aegiali and the beach. 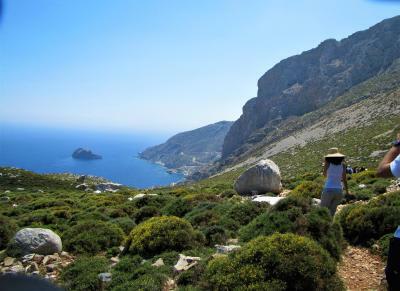 Chora is 11 mi, while the port of Katapola is 16 mi away. Hotel Vigla also provides a free guest parking area. When would you like to stay at Vigla Hotel? 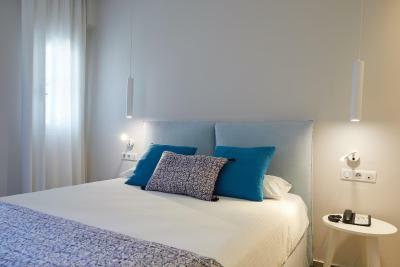 This bright, air-conditioned room is built according to the traditional, Cycladic architecture. 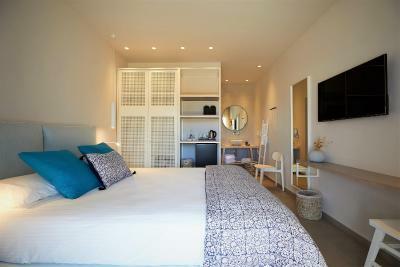 Opening out to a balcony with views over Amorgos Island, it includes a TV and fridge, as well as a safe and hairdryer. Guests are welcomed with a traditional drink. Easter package includes a welcome drink, rich homemade buffet breakfast, free WiFi, traditional liquor in the room, Easter candles and Festive dinner on Holy Saturday with traditional Mageiritsa, appetizers, salad, wine, refreshments, water and red eggs. Please note that Lunch or Dinner on Easter Sunday including stuffed goat baked in a traditional oven, Mageiritsa, seasonal salad and 2 appetizers, red eggs, wine, refreshments and water are available at an extra charge of 22 EUR per person. 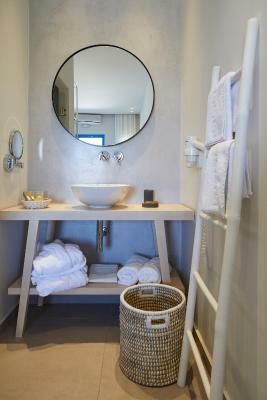 House Rules Vigla Hotel takes special requests – add in the next step! 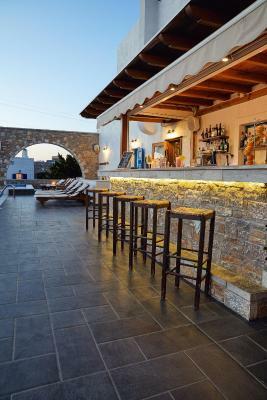 Vigla Hotel accepts these cards and reserves the right to temporarily hold an amount prior to arrival. Please inform Vigla Hotel of your expected arrival time in advance. You can use the Special Requests box when booking, or contact the property directly using the contact details in your confirmation. Bad value for money. Poor facilities (not even an iron). Part of the staff was rude. The water in the pool was dirty. Breakfast was nothing special and they charge you even for a cappuccino. You need a car to go anywhere. Swimming pool is open after 10 AM. I wish I could have use it at least at 9AM- before breakfast. If you are an early waking up person, than this might be a problem. 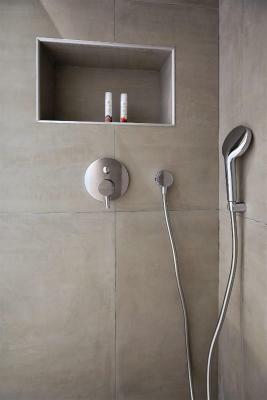 Maybe, water should be hotter in the shower and water for coffee and tea at breakfast should be bottled. 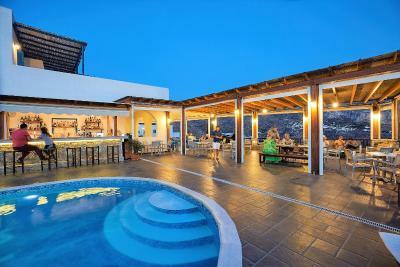 Location next to excellent restaurants and views. Coffee at breakfast didn't taste much, but great breakfast with a lot of homemade stuff. There is a new and an old part of the hotel. New rooms are much better and more modern.We had a noisy fridge in the room and the balcony was very small and the access to it was a little bit difficult.